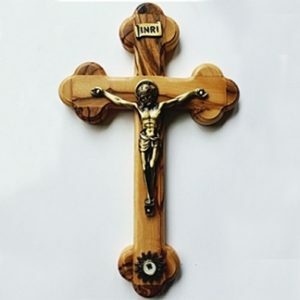 Description: Holy Land Crucifix with Relic that Touched the Tomb of Jesus. 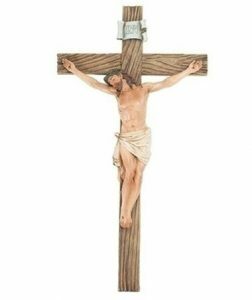 This beautiful crucifix is handcrafted of olive wood from Bethlehem, the Holy Land. It features an antique brass corpus. The bronze finished case, which resembles the star of Bethlehem, contains a piece of cloth that has touched Jesus’ tomb at the Holy Sepulcher in Jerusalem. Crucifix comes with a certificate of verification. 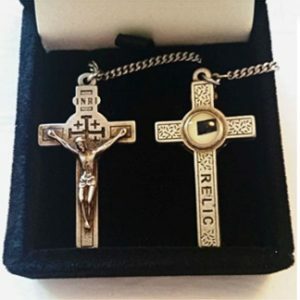 Dimensions: We offer the crucifix in two sizes. 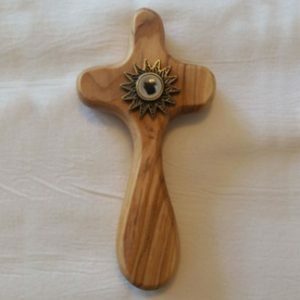 Description: This unique cross from the Holy Land is handcrafted using the pruned branches of the olive trees growing on the hills of Bethlehem and Jerusalem. The bronzed finished case, which resembles the star of Bethlehem, contains a relic that has touched Jesus’ tomb at the Holy Sepulcher in Jerusalem. Made to fit comfortably in your hand, it comes with a beautiful explanatory card, with 2 Corinthians 1:3-4 on the reverse. 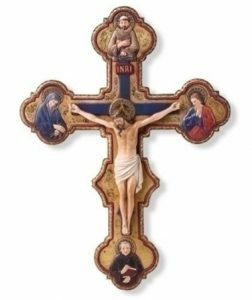 Description: The creator of this striking crucifix was a gifted follower of Orcagna, the greatest Florentine painter of the middle years of the 14th century. The original crucifix can be viewed at the Metropolitan Museum of Art. Dimensions: Resin/stone mix. ; 14.5”H x 10.75”W x 1.5”D. 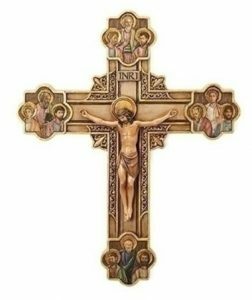 Description: Inspired by 14th Century Florentine design, this striking crucifix portrays Jesus framed in gold scrollwork, surrounded by His Twelve Apostles. The delicate painting and intricate detail make this piece a splendid example of the Renaissance art movement. Dimension: Resin/stone mix. 12”H x 9.75”W x 1.13”D. Description: From the Renaissance Collection of Joseph’s studio, this beautiful crucifix measures 13.25 inches. Very traditional and rich in detail, with a wood-like finish. Dimension: 13.25H x 7.5W x 1.5D. 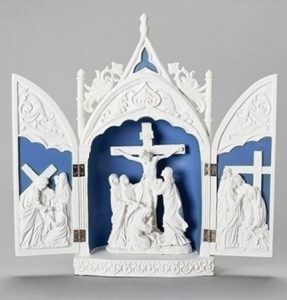 Description: Christ submits to the Father in this stunning artwork classic by Italian Della Robbia.In blue and white ceramic.